ROBsessed™ - Addicted to Robert Pattinson: NEW PIC: Robert Pattinson and his sweet smiling filmed for Red Nose Day charity event! NEW PIC: Robert Pattinson and his sweet smiling filmed for Red Nose Day charity event! I love when we get Rob surprises!!!! Photo caption: Filming for @rednosedayUS - I know who i would. 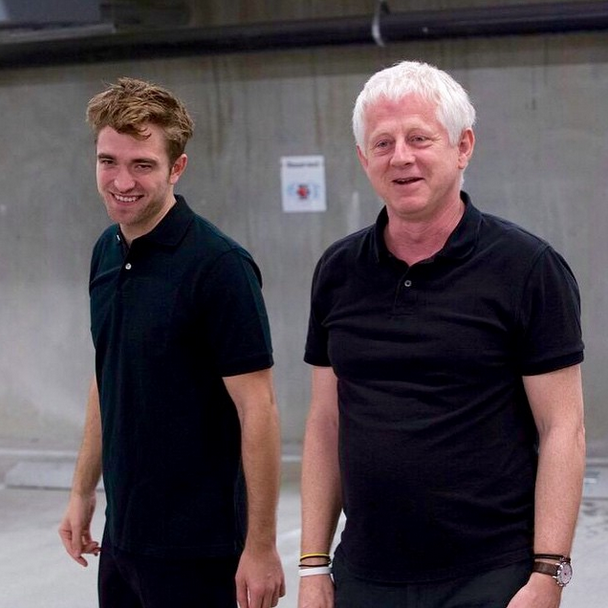 The man with Rob is Richard Curtis, screenwriter of Love Actually, Four Weddings and a Funeral, Bridget Jones's Diary and much more! Red Nose Day will air their televised event this Thursday, May 21st at 8pm on NBC. We'll see if Rob's segment pops up there! Red Nose Day is a campaign dedicated to raising money for children and young people living in poverty by simply having fun and making people laugh. The inaugural Red Nose Day will be held in the US on May 21st, 2015. People across the country will come together to have fun and raise funds and awareness. The day's events will culminate in a three-hour entertainment TV special on NBC featuring the country's favorite comedians, musicians and Hollywood stars—it's a show not to be missed! Join in the fun and start planning how you can help support Red Nose Day in your community! It's so easy and the opportunities are endless. Check out our Fundraising page for ideas! Click HERE to donate to ANOTHER of Rob's great causes. Photo: Source | Thanks Cosmo!